It’s tempting to start this by saying I had been grieving the loss of my mum for most of my life, but to be honest that’s too simplistic. She wasn’t dead to me, far from it, she was painfully present in my mind. But at some point she had given up on life, and like those zombie hands reaching out of cartoon graves, she seemed to want to take everyone down with her. 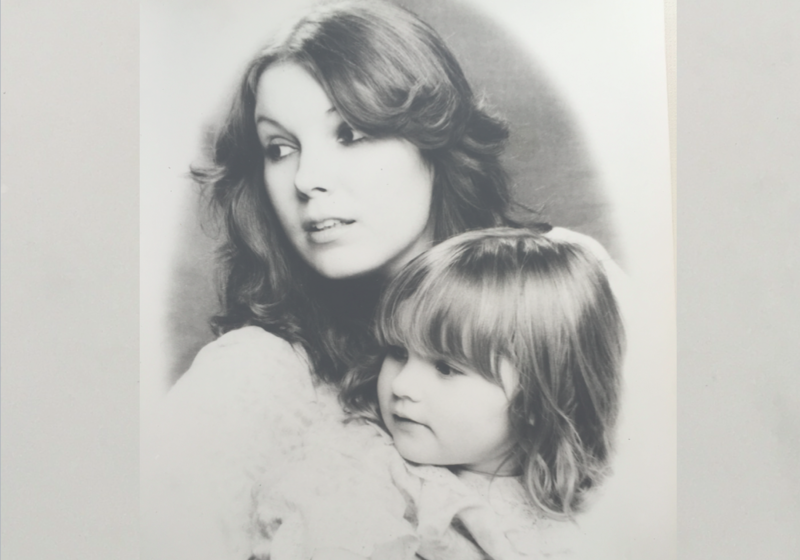 From what I’ve leant since, losing your mother at any age is debilitatingly hard, but losing your mother right after having baby yourself is like being rocketed into space and floating around in a tin can with a dodgy FaceTime connection to earth with sometimes only bleeps and images of faces getting through. I also now realise when I see eulogies about other people’s lost leading ladies, that losing a great mother is very different to losing someone who had failed, for whatever reason, to be one. There is no comparison as to whose pain is greater, there are no medals to be handed out for who suffers more when the cruelness of life bites, but there is a difference in the healing, and in dealing with it. I’m almost three years in now. My mum died eight weeks after my son Larkin was born and I think if there is a positive, it happening then stopped me from completely falling apart from the sheer craziness of it all. After a fairly traumatic emergency C-section and still lodging in a room at my stepdad’s as our new home wasn’t yet ready, I wasn’t in the best place – physically or geographically – to feel immediately bonded with my son. Dealing with my mother’s (unbeknown to us) last days wasn’t easy either. When I visited her I had to anxiously leave Larkin outside in the pram, in October, as her house was so filthy I daren’t bring him in. Having two dependents felt like a little too much to handle for someone who feels like they are balancing life like a three legged table. During the year following Larkin’s birth and my mother’s death I operated on autopilot. I can only describe it as feeling like I was doing a really great job of looking after someone else’s baby – I knew I loved him, I just couldn’t really feel it. That’s the thing when you bury negative emotions, the good ones tend to get sucked in there too for fear of feeling anything at all. My alcohol intake doubled almost overnight. I’d been having trouble with breast feeding anyway and her dying killed that off too, and I felt like I just needed to be numb. Thankfully with a small child the days run into years like wild horses over the hills and I don’t have that much time to think about it now, and that’s a relief. But I know from experience, not dealing with stuff generally comes back to haunt you. Whilst I react quite badly to her anniversaries I still haven’t had any counselling which previously has been the best thing I’ve ever done for myself. Maybe I’m resisting, but also a part of me just can’t be bothered to dredge it all up now she’s actually finally gone. Something else I’m coming to terms with is that you are really not OK for a very long time after the death of your mother, which is something that I think is really only ever understood properly by people who have gone though it. It’s unfortunate, and some of my friends have fallen by the wayside through misunderstanding as realistically you can’t go around with a placard saying MY MUM DIED AND I’M REALLY NOT OK YET, so you have to internalise a lot of it. The acuteness of it being my mother who died is that there’s a constant niggle for me that I just don’t know how to be a good parent. My dad left us when I was 18-months-old and my mum kind of fell apart. I guess ironically I parented her. But even so, that didn’t prepare me or give me any confidence when I had my own child. To add another layer to this, my mother’s own father died while she was in the womb, and in turn my grandmother became an overly fussy mother, I think partly explaining my mother’s life long eating disorder. So this stuff about being OK yourself and not just living for, and through your child, does have a huge impact. If I’ve leant anything through all this it is that if you are generally ok, then your kids will be ok too. They don’t need anything but nurturing, and your time. That’s hard when you feel you have little to give and you are trying to heal and comfort the hurting child within you, but their love and life is the most healing gift you can hope for and I have revelled in it, and am healing though it. And while I don’t believe in God, I do believe in the universe, and in bon mots. So as the universe giveth, and the universe taketh away, you reap what you sow, so sow those little seeds well for they do nourish you, as much as you nourish them. Grace lives in Hertfordshire with her husband Ken and their 3-year-old son, Larkin. For more follow @gracewoodward or see gracewoodward.com.